False reports on social media are making the jobs of first responders harder. Meanwhile, Uber staffers met their new leader and White House employees planned to say goodbye to Sean Spicer. Hurricane Harvey recovery efforts continue in Houston. (Image via Wikimedia Commons). 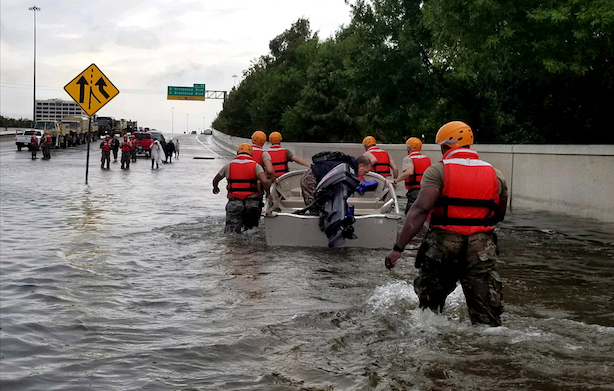 Fake news is hindering rescue and recovery efforts in Houston. The spread of unverified or outlandish information on social media, such as reports of a shark swimming in flooded highways, is making first responders’ jobs more difficult by filling 9-1-1 lines and causing panic, one law enforcement official told PBS NewsHour. Officials are bracing the public for "weeks and months" of recovery efforts in the greater Houston area after Hurricane Harvey, according to NBC News. Apple CEO Tim Cook penned a memo to staff on Wednesday detailing how the technology giant is pitching in with recovery efforts, including specially tailored iPads for first responders and initiatives to find employees temporary housing, according to Mashable. The company is also raising money for victims via iTunes. Companies raised more than $72 million for recovery efforts as of Wednesday, according to CNN. Fox is planning to offer marketers a no huddle offense of sorts this fall. The network will sell six-second spots to advertisers during NFL games this season, according to The New York Times. While the network offered bite-sized spots to brands for the Teen Choice Awards this month, football fans will see the short ads for the first time on September 10. White House staffers are planning a goodbye bash for Sean Spicer this evening. Spicer, likely the best known White House press secretary in history thanks to Saturday Night Live, resigned in July but stuck around the West Wing through the end of this month. He also got to finally meet Pope Francis this weekend after a very public snubbing at the hands of his boss in May. Outgoing Uber chief Travis Kalanick introduced incoming CEO Dara Khosrowshahi on Wednesday for his first meeting with staff. The exiting Expedia chief executive told employees that Uber’s culture has to change, according to comments tweeted by the company, and set an 18- to 36-month timeline for an IPO. In a rare kumbaya moment at Uber, Khosrowshahi also posed for a picture with Kalanick and fellow executive Arianna Huffington.